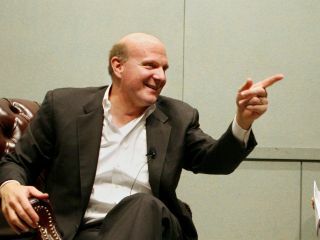 Microsoft's cloud OS is a mere few weeks away from becoming a reality according to Steve Ballmer. Ballmer, talking to partner event in London reiterated the need for an operating system that would suit the increasing demand of consumers for 'cloud' computing, or internet-based services and data storage. "We need a new operating system designed for the cloud and we will introduce one in about four weeks, we'll even have a name to give you by then. But let's just call it for the purposes of today 'Windows Cloud'," said Ballmer, as reported in the Register. "Just like Windows Server looked a lot like Windows but with new properties, new characteristics and new features, so will Windows Cloud look a lot like Windows Server. "We're not driving an agenda towards being service providers, but we've gotta build a service that is Windows in the cloud." The chances are that any new OS will use much of the company's existing platform, leaning heavily on the existing Live services like 'SkyDrive' storage, Hotmail and Messenger – but also have geo replication and a new search oriented architecture (SOA) model. With Windows 7 finally entering its pre-Beta stage at the forthcoming Professional Developers Conference at the end of October, Microsoft's desire to get back on track after the towering failure of Vista to convince business or consumer fields that Windows is here to stay is palpable. However, with cloud computing and Midori both hitting the agenda again, the company is hedging its bets for the next generation of OS. Ballmer insisted that Midori – the codename for a project to find a post-Windows OS – is still merely research. "Our big problem is there's just no secret that gets kept in Microsoft. The guy in the office next door to somebody working on Midori is not supposed to know about Midori," added Ballmer. "The last thing we want is for somebody else to obsolete us, if we're gonna get obseleted [sic] we better do it to ourselves."